Duramin-40 is the primary range of Struers micro/macro hardness testers. It is available with a manual and motorised XY-stage and with an overview camera. Duramin-40 comes with three load ranges; 10 gf – 10 kgf, 10 gf – 31.25 kgf, and 1 gf – 62.5 kgf. The tester includes an integrated PC with a separate monitor for touch screen or mouse operation. Duel monitors are also an option. The test cycle is fully automatic and a motorised 6-position turret is standard. Add-on modules include Kc fracture measurements, mapping and weld measurements. The wide test load range from 1 gf to 62.5 kgf means that the Duramin-40 can be used for many different applications that previously required both a micro and a macro indentation hardness tester. 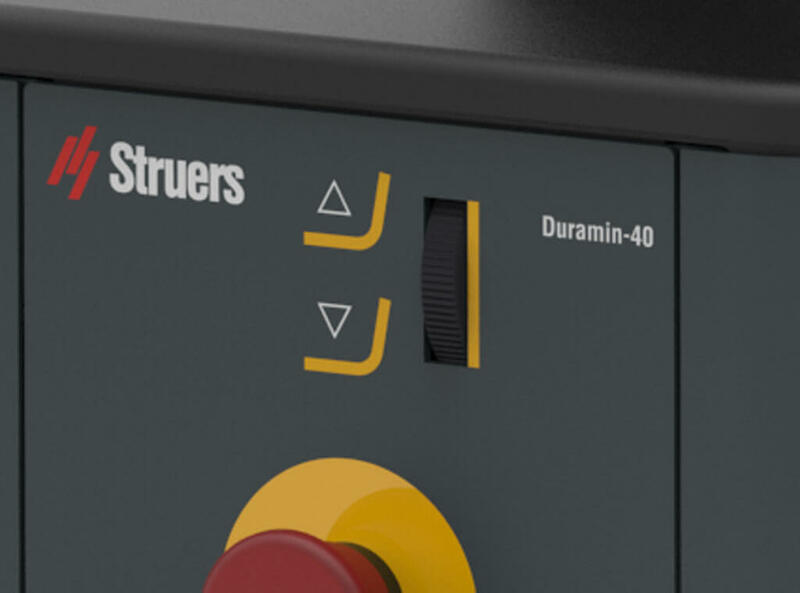 The Duramin-40 conforms to all operating standards while ensuring repeatability throughout the entire load range, thanks to cutting-edge load-cell technology. 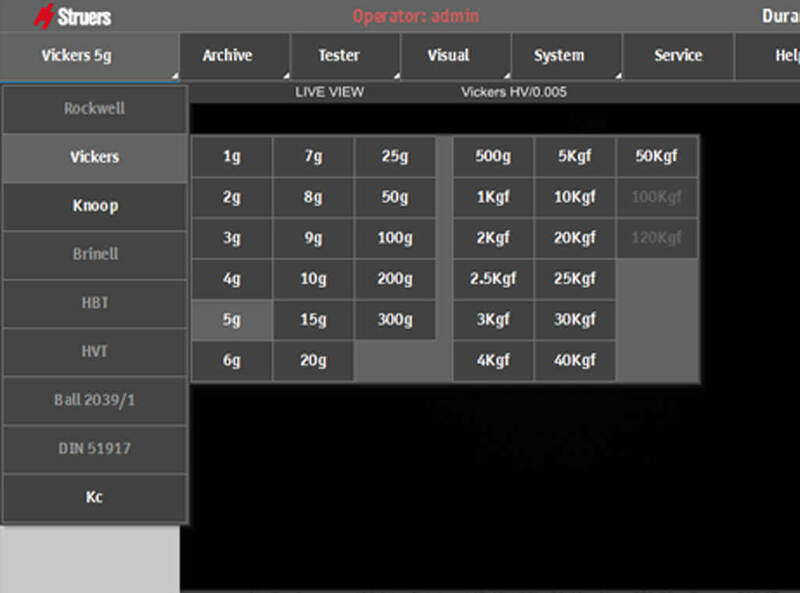 The optional dual monitor solution enables the general measurement data and macro overview image to be viewed on two different monitors. This eases set up and saves time when executing the advanced test series. Load-cell technology ensures the highest possible degree of accuracy and repeatability during load application. This eliminates the over- and undershoot from dead weight systems. The absence of mechanical weights means that there are no friction problems and the equipment is less sensitive to misalignments caused by vibrations. Combined with a motorised turret, the entire measurement cycle of loading, indenting, unloading, focusing and evaluating is carried out extremely quickly. Human and calibration errors can be avoided with the Duramin-40’s automatic turret. It is available with a six or seven-position automatic turret facilitating exchange of up to six indenters and five objective lenses. The exchange of indenter and lens runs fully automatically in every model. 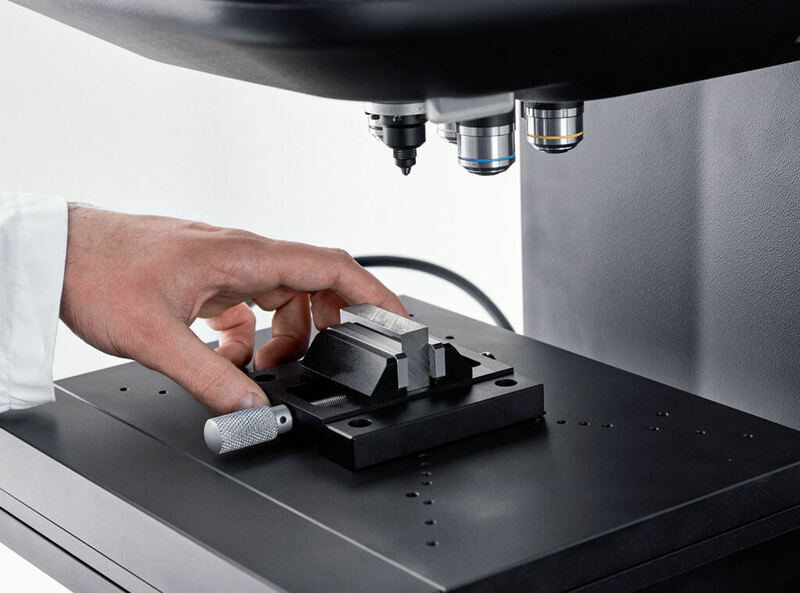 The unique test load range, from 0.00981 N to 612.9 N, can cover many applications that usually require both a micro- and a macro indentation hardness tester. 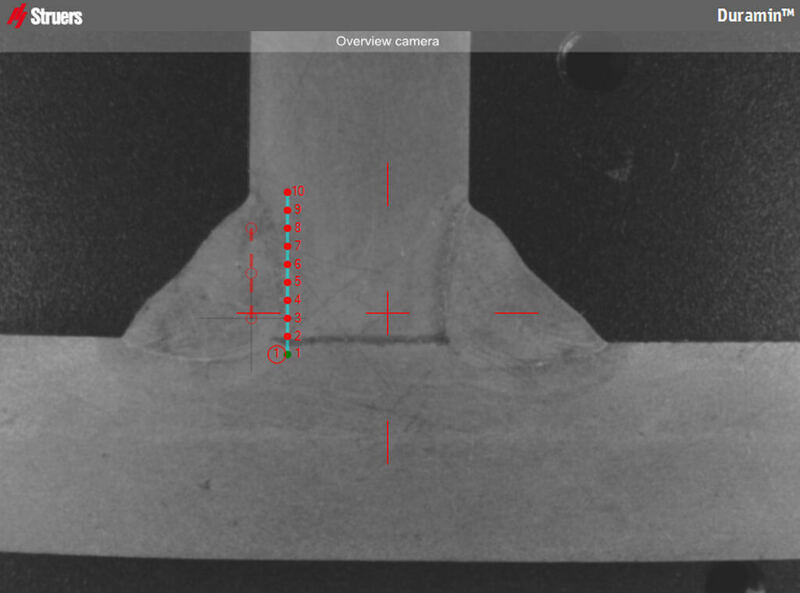 Duramin-40 covers a wide range of Brinell, Vickers and Knoop test methods and can automatically convert hardness values according to current standards. Duramin-40 is equipped with a motorised Z-axis as standard. This eliminates the task of manually adjusting the testing height. The optional overview camera makes it easy to position the test point series across a sample and execute with a few mouse clicks. This feature ensures simplified execution and set-up, and is helpful when performing repetitive or high volume CHD-measurements. 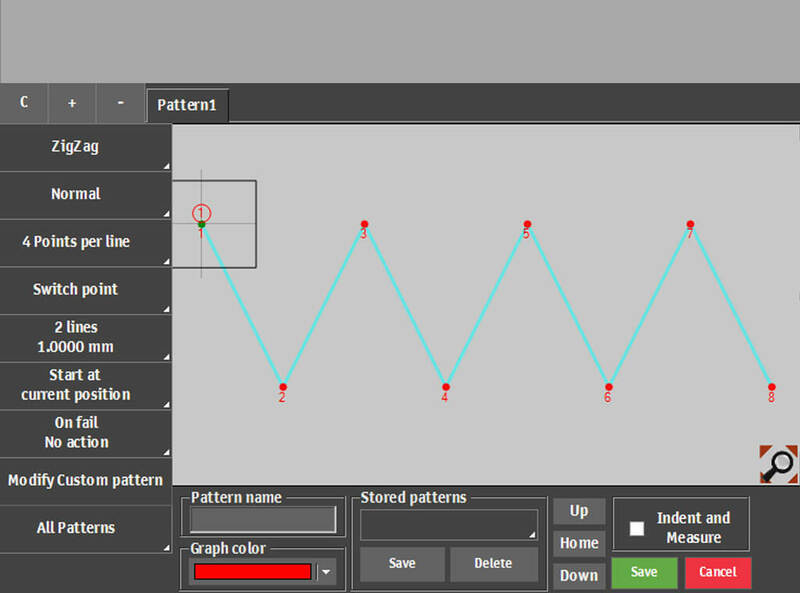 A number of software modules are available to match particular applications. 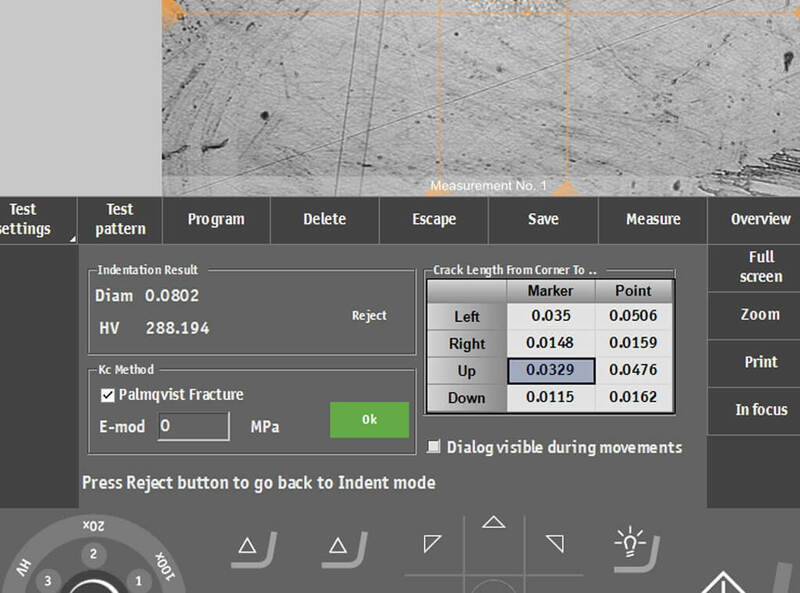 These include modules covering weld measurement, surface mapping, edge detection and Kc fracture toughness calculation. Duramin-40 is available with a built-in test point editor to define and set-up measurement lines for fully automatic testing, for example, CHD-testing. 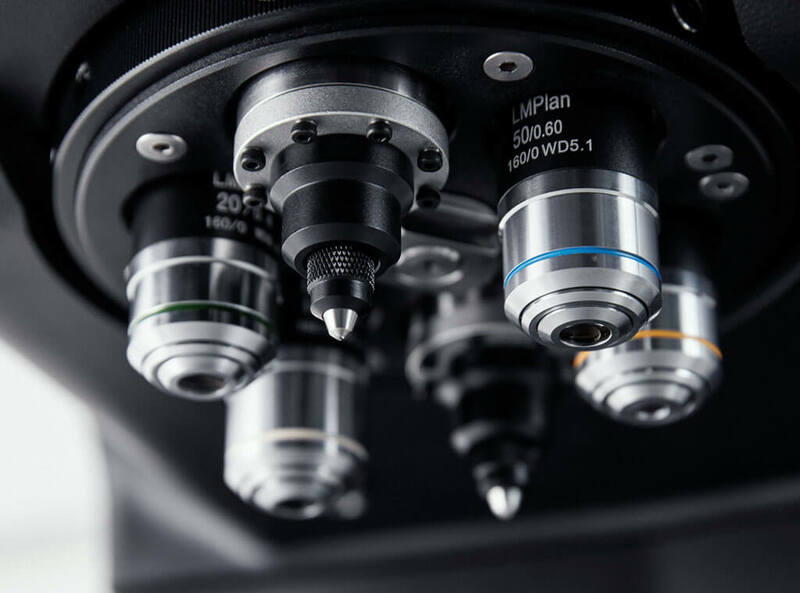 All testers within the Duramin-40 range come with motorised Z-axis, high-resolution camera, LED illumination, auto focus and automatic image evaluation. All include an integrated PC with 15” colour touch screen. Duramin-40 M comes with a manual XY-stage (size 90 x 90 mm, stroke 25 x 25 mm) including manual micrometers. Test height is 0-200 mm. It includes a motorised 6-position measurement turret. Duramin-40 A comes with a test point editor and motorised XY-stage (size 350 x 225 mm, stroke 220 x 120 mm). Test height is 0-200 mm. It includes an automatic 6-position measurement turret. Duramin-40 AC comes with a test point editor and motorised XY-stage (size 350 x 225 mm, stroke 220 x 120 mm). Test height is 0-200 mm. It includes an automatic 7-position measurement turret, with an overview camera (FOV 200 x 160 mm) for easy test point positioning. 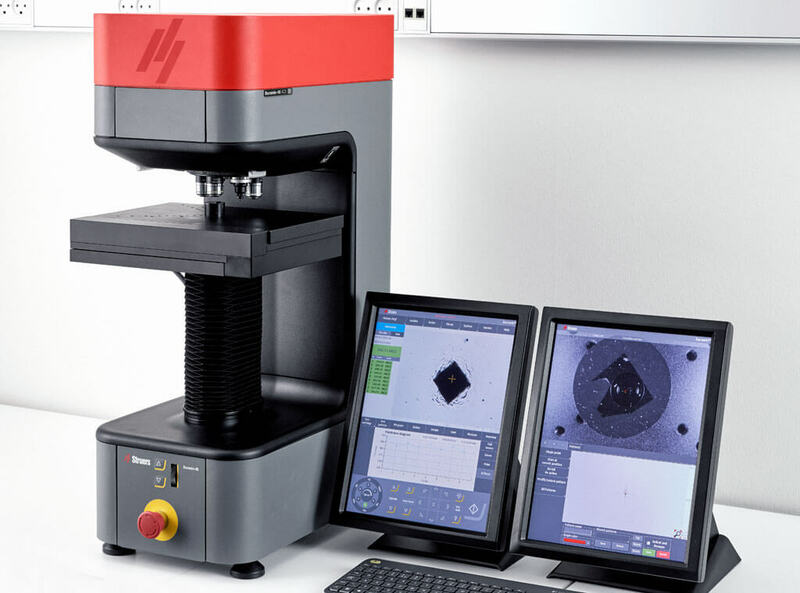 Low load hardness tester based on load-cell technology for the automatic testing of Vickers, Knoop and Brinell. With an extended test load range of 0.098 – 98.1 N (10 gf – 10 kgf). Low load hardness tester based on load-cell technology for the automatic testing of Vickers, Knoop and Brinell. With an extended test load range of 0.098 – 306.4 N (10 gf – 31.25 kgf). Low load hardness tester based on load-cell technology, for the automatic testing of Vickers, Knoop and Brinell. With an extended test load range of 0.0098 – 612.9 N (1 gf – 62.5 kgf).